Considering that the first vintage home furnishings image to be added to FreeVintageArt.com was a chair, it seems only fitting that the second should be a table to go with it. I will, however, leave it up to you to match the proportions and background colors. ‘Legitimate formation’? Phew. Glad folks don’t talk that way anymore, sounds kinda silly and pompous. 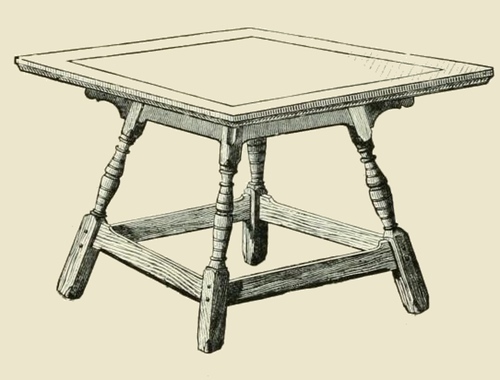 Personally, I see this as a somewhat straightforward square table with four nicely turned legs and four cross braces. Seems like it would make a nice kitchen table or side table, depending upon how large it is. Irregardless, of what it was used for in 1870, this vintage wood table drawing can be used however you wish as it is in the public domain.